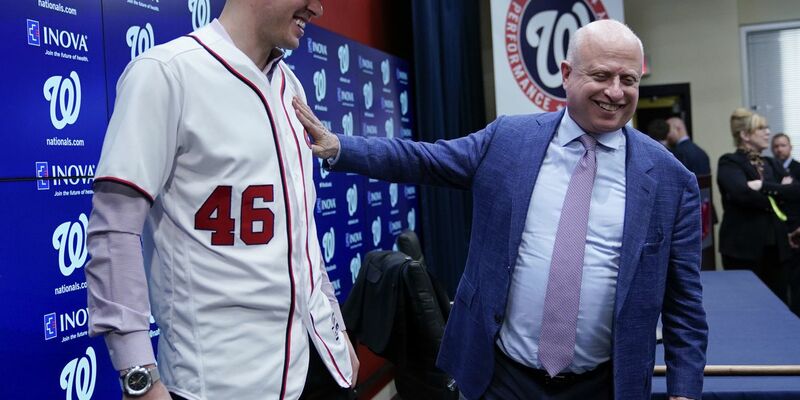 WASHINGTON (AP) — As with most things involving the Washington Nationals' offseason, a day that was supposed to be all about introducing Patrick Corbin morphed into a day about Bryce Harper. How might the big bucks he used to outbid the New York Yankees and Philadelphia Phillies for Corbin affect the pursuit of Washington's own big-deal free agent, right fielder Harper? "I think they're independent of each other. I really do. We've gone about this business of creating a roster for 2019, and at the end of the day, we'll figure out whether that includes 'Harp' or not," Rizzo said. "We thought it was good business — we had to fix the things we needed to fix. 'Harp' is a big part of our family, and we'd love to have him back." But in an interview Friday with radio station 106.7 The Fan, Nationals owner Mark Lerner painted a different picture about where things stand with Harper, who didn't accept a late-season offer from Washington. "I really don't expect him to come back at this point," Lerner said. "I think they've decided to move on. There's just too much money out there that he'd be leaving on the table." Lerner also described the team's earlier offer to the 2012 NL Rookie of the Year and 2015 NL MVP, reportedly for $300 million over 10 years, as "the best we can do." The Harper issue hangs over all of baseball as the winter meetings are set to begin Monday in Las Vegas, but it's not as though the Nationals have been waiting around to see how it's resolved. Rizzo has made a string of moves early in the offseason, adding two catchers — one, Yan Gomes, attended Corbin's news conference, as did longtime first baseman Ryan Zimmerman — and two late-inning relievers, in addition to Corbin, a two-time NL All-Star who was 11-7 with a 3.15 ERA for the Arizona Diamondbacks in 2018. "We feel good about where we're at," Rizzo said about his starting staff. "We've got our Big 3." They certainly do, and at a significant price. Corbin joins three-time Cy Young Award winner Scherzer, he of the $210 million deal, and three-time NL All-Star Strasburg, with a $175 million extension of his own. "As you've heard me say many, many times: Pitching is king," Rizzo said. Corbin gets a $2.5 million signing bonus payable next Oct. 31 and salaries of $12.5 million next season, $19 million in 2020, $24 million in 2021, $23 million in 2022, $24 million in 2023 and $35 million in 2024 — when he turns 35. The final year's salary includes $10 million that will be deferred without interest and payable on Jan. 15, 2026. He would earn $500,000 for winning a Cy Young Award, $250,000 for finishing second in the voting, $150,000 for third, $100,000 for fourth and $75,000 for fifth, and the same awards for Most Valuable Player balloting. He would earn $100,000 for each All-Star appearance, $100,000 apiece for any Gold Glove or Silver Slugger, $250,000 for World Series MVP and $150,000 for League Championship Series MVP. "We've allocated a lot of resources to our front of the rotation, and I think that elite starters, middle-lineup bats and back-end relievers is where I think you spend your money," he said, "and you try to get values along the periphery of your roster."